Ridgwell and Pig Ear Press join forces again and produce hand-stitched beauty. Time to check in on authors who regularly get radared here at Urban F HQ. I’ve had this little burgundy book for a while now. After six weeks off work it’s amazing what you find in your notes and hidden journals around the place. A sketch of a volcano, lists of strange encounters, overheard conversations, personal dreams and a short paragraph on Joseph Ridgwell’s, Mexico. 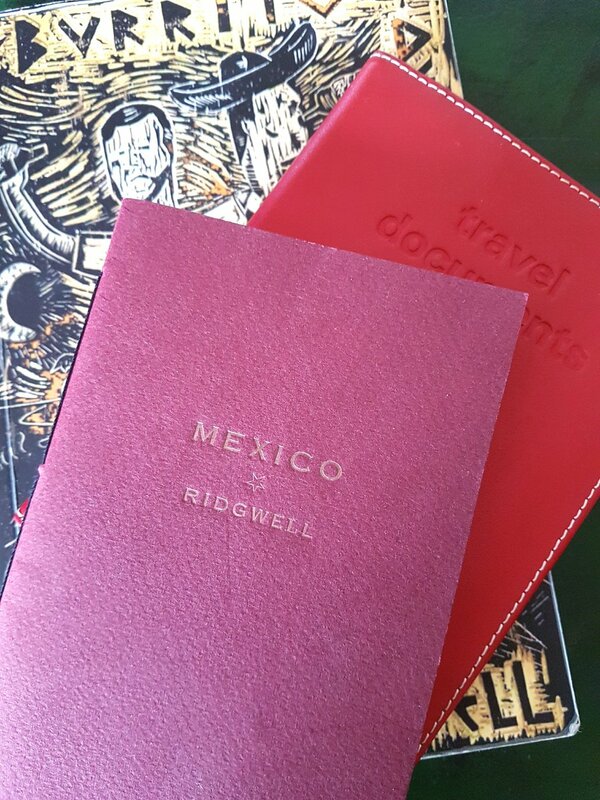 Having been familiar with Ridgwell’s classic road novel Burrito Deluxe, also set within a Mexican backdrop, I couldn’t resist this little gem on offer from Pig Ear Press. A kind of mini Burrito… with less chili. Shaped like a British passport, its gold embossing tells of hearts belonging – at this particular moment – somewhere else, somewhere exotic, somewhere away from the fuzz. Back on the Beach Of The Dead, our favourite miscreant Ronnie is waxing astronomical with wads of philosophy between sips, snorts and swings. “It’s like everything’s dead, even the stars are stillborn“. Back on the prowl, the boys begin looking for more fun before Armageddon, in which, Ronnie & Joe experience some tender and unlawful moments. Mexico is another taste of the writing style and stories you’ll get from a Ridgwell release. The difference between this and other snippets and short stories is the sexdefying splendor of the print job. All this artisan book binding, handmade paper, embossing and personal touches has this printer’s daughter weak at the knees. It ain’t long, but its quality counts for more. If you are a supporter of the small press revolution, then seek out similar gems from this publisher, if you are new to this rebel lit fiend caper, than this would be a great start to your collection and the many adventures of Joseph Ridgwell.